Background. Despite significant success with chemotherapy and vaccine prophylaxis, influenza remains a poorly controlled infection. Outbreaks of highly pathogenic H5N1 influenza virus infection, rapid development of oseltamivir- resistance among A(H1N1) influenza viruses and appearance in 2009 of a new pandemic influenza A virus have triggered renewed interest in influenza infection. There is thus a need for search and development of new effective antivirals with broad spectrum of activity. Glycirrhizic acid (GA) was previously shown to possess an inhibitory activity against influenza virus in chicken embryos and on mouse model of influenza pneumonia. Dipeptide glutamyl- tryptophane (EW) is known as activator of innate immunity with antitumor activity, ability to attenuate the chemoradiation- induced oral mucositis and with inhibitory activity againstherpes simplex virus type 2. Here we describe the activity of the combination of these compounds against human influenza virus in in vivo models. hemagglutination test, and structure of the lung tissue was studied by morphology and morphometric analysis. Results. First of all, we found that GA alone (10 mg/kg body weight) slightly decreased the virus titer in mouse lungs. 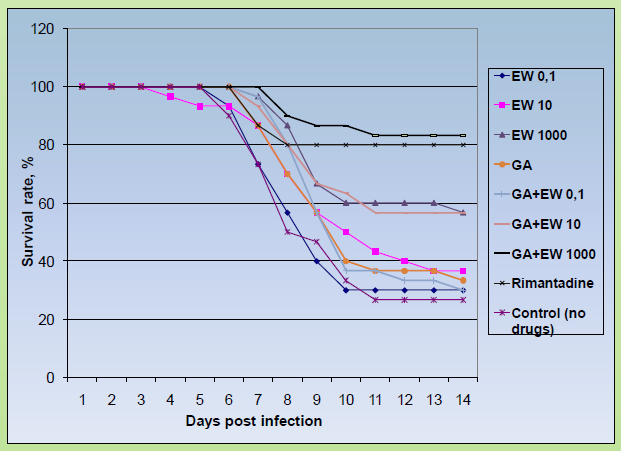 Oral application of EW and GA together resulted in significant decrease of infectious titers of influenza virus. For some doses this effect exceeded that of the reference compound rimantadine (Fig. 1). Fig.1. Effect of combination of EW/GA on replication of rimantadine- sensitive influenza virus A/Aichi/2/68 (H3N2) in mouse lungs. The dose of GA was 10 mg/kg/day, doses of EW were 0 – 1000 micrograms/kg/day. Next, the activity of EW/GA combination was demonstrated as a protection of animals from influenza virus- induced lethal pneumonia. 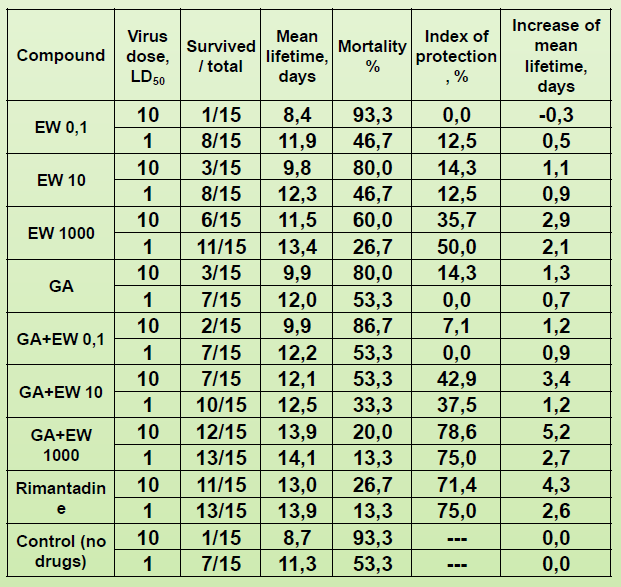 Oral application of the compounds resulted in decreasing of mortality and increasing of mean lifetime (Table 1, Fig.2). Table 1. Protective activity of EW/GA combination on the model of influenza pneumonia of white mice. Fig.2. Dynamics of mortality of EW/GA- treated white mice in the course of influenza pneumonia. 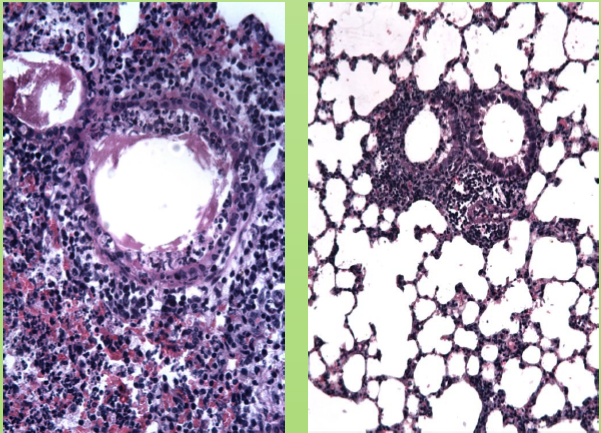 Morphological analysis of mouse lungs revealed that application of EW/GA also led to improvement of morphology of lung tissue comparing to non- treated animals. It decreased the signs of influenza pneumonia, such as lung edema, inflammatory infiltration and epithelial cell damage (Fig.3). Fig.3. EW/GA decreases the signs of influenza pneumonia in white mice and normalizes the structure of lung tissue. Left — control animals, right — EW/GA- treated animals. 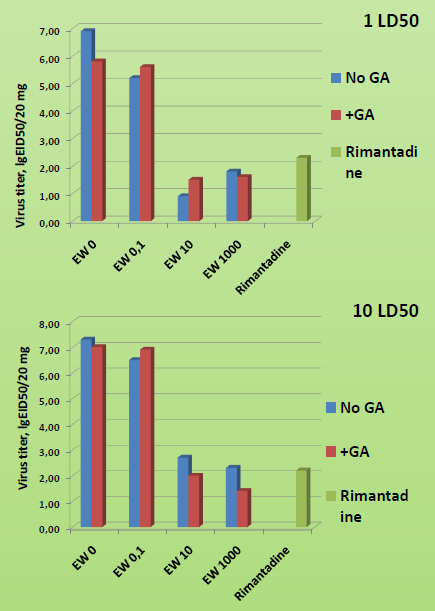 Based on the results obtained (composition of 10 mg/kg GA and 1 mg/kg EW which appeared the most active), we tested the anti- viral activity of EW/GA combination on the model of lethal pneumonia caused by mouse- adapted oseltamivir- resistant influenza virus A/Vladivostok/02/2009 (H1N1). In contrast to the reference compound Tamiflu and in accordance with previous results it decreased the specific mortality of animals, increased their mean lifetime and normalised the structure of lung tissue (Table 2, Figs.4, 5). Table 2. Protective activity of EW/GA combination on the model of influenza pneumonia of white mice caused by oselamivir- resistant strain A/Vladivostok/02/2009 (H1N1). Fig. 4. Dynamics of mortality of EW/GA- treated white mice in the course of influenza pneumonia caused by oselamivir- resistant strain A/Vladivostok/02/2009 (H1N1). Fig.5. Structure of lung tissue of mice infected with by oselamivir- resistant strain A/Vladivostok/02/2009 (H1N1) and treated with placebo(A), EW/GA (B) or Tamiflu (C). Conclusion. 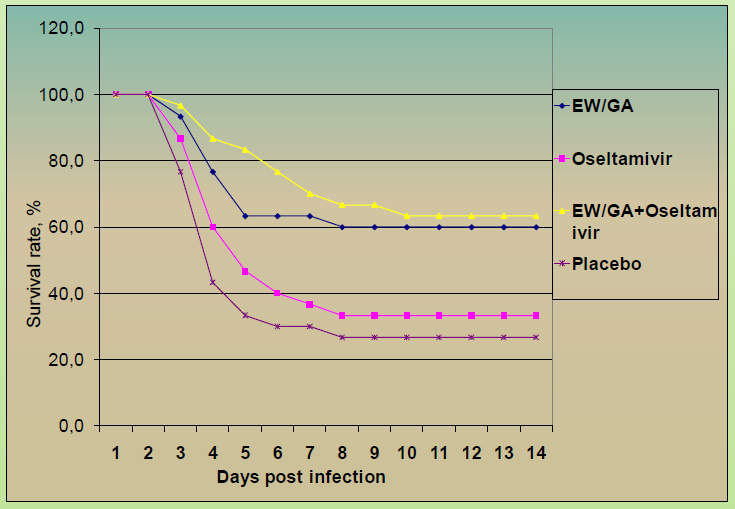 In the present study we optimized the combination of EW and GA and demonstrate its activity against oseltamivir- resistant strain of influenza virus thus overcoming the Tamiflu- resistance of A(H1N1) virus of pre- pandemic season. Based on the results obtained, EW/GA combination should be considered as a broad- spectrum antiviral, and an important part of complex anti-influenza therapy, including its severe cases.